NO WAITING BETWEEN SETTING AND GROUTING IS REQUIRED. Leave tile spacers in place and remove just prior to grouting. You may grout tiles immediately or up to 24 hours after setting. Use grout float to scoop the grout. 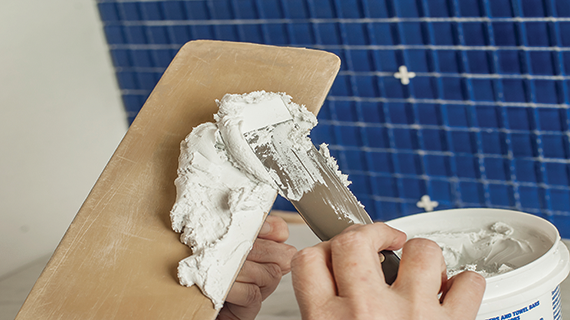 Use grout float at 45 degree angle to the tile surface to firmly pack the grout into the grout areas. Clean grout float in water bucket and use at 45 degree angle to grout lines to squeegee excess grout from tile. 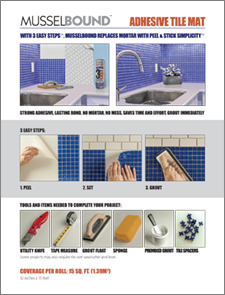 After the grout has become firm and taking care not to rub grout out of the grout areas, use slightly moistened sponge to wipe grout film from surface of tile. Make sure sponge is clean by rinsing sponge in water bucket; change water in bucket often. Repeat. Be sure to follow grout manufacturer’s specific instructions. 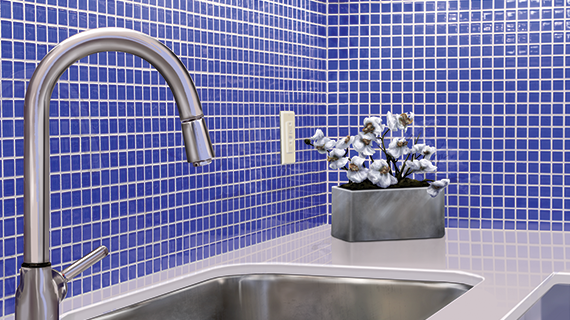 When grout is completely clean and dry, replace removed sinks, cooktops or other obstructions. Re-install removed electrical covers (longer screws may often be required) and turn power on following all electrical codes and safety procedures. Click image above for first page. For wet area applications, the use of caulk in the bottom grout line may be preferred to applying grout.